The Rangers come into Montreal flying high after shutting down the star studded duo of Crosby/Malkin in a game against a Pittsburgh team that meant business. Petr Prucha was the unlikely hero in that one, and even though the goal he scored in the 3rd period saved the game for the Rangers, the Garden faithful were loud as ever with "Boos". But, onto tonight's game for now, which should be one of the toughest games for the Rangers to date. Both elite teams in the Eastern Conference this season and over the past few years, Montreal is always a deadly threat, especially with past Ranger Alexei Kovalev as dangerous as anyone in the NHL with his stick handling around the net. Tonight Lundqvist should bounce back from a so-so game last night after shining in the shootout as always, but how many games will the Rangers have to pray that Their King will save those 3 shots in the shootout to win the game for them? 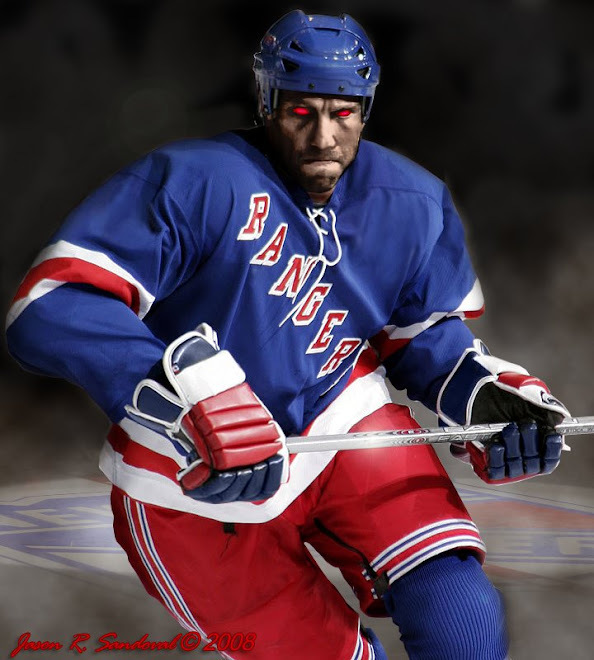 Nevertheless, if Lundy shows up to play tonight along with fellow mates Naslund and Zherdev, we should be fine, right? Well just in case those players that are paid the big bucks to score don't show up or are simply smothered by the "Big Red" D of Montreal, perhaps the story book ending of Prucha can carry over, or maybe the plethora of sophmores including Dubinsky, Dawes and Callahan can chip in with offense the way that we the fans know that they can. Look out for a very chippy and physical game with a lot of shots, as both of these teams very talented up front, in the back and side to side. Hopefully the Blueshirts will silent the tremendous groans coming from the fans in Montreal tonight and we can move on to 40 points at the beginning of December! Wowzer. Those weren't boos after Prucha scored. Those were PRUUUUUUUUUUUUUS! Hey 5-hole....clean your ears out. Please explain to me why people would be booing after the Rangers scored a goal at MSG. The PRUUU chant is a common one for him. Just like DRUU for Drury and DUUUUUUUB for Dubinsky. If you heard booing it was probably the many Penguins fans that were there. If you boo your own team, shame on you. You don't deserve to be in the building. PRUUUUUU is praise for the once 20+ goal scoring once rookie, Prucha. 5-hole is right! Let's recap this shall we....this goal by Prucha was his first in 20 games. And those 20 games were so spread out. There are a lot of players or even "stars of their team" out there that have played night after night and don't score in 20 games. I give Prucha a hell yeah for shoving it in their faces...ahem team Capt. Drury! Let us also not overlook the fact that Pruchs didn't skate his way around 3 forwards, split the defenders and deke Price out of his skates. It was a "garbage" goal tap in. Most guys in the same position find the back of the net. The two other guys being rotated in and out would, at half Prucha's cap hit. Yessssir, I agree with you "J", as I previously stated in my last post about the benching dilemma. Renney should not feel hesitant to bench any of his players, especially any of his star players such as Wade Redden, Kalinin, Gomez, etc. only up to a few periods during that stretch of benching, of course. Benching them for a period or two has already proved affective for Drury, Naslund and Zherdev...why not try the same process on any slacking player? With hope, this effort should add extra pressure on those players expected to produce positively so they don't have to face the dreaded HSS (healthy scratch syndrome), which I hear has the amazing ability to simultaneously cure the common problem of inefficient play.